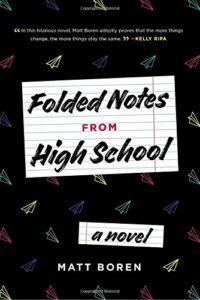 I was flailing around for an audiobook a few weeks ago, and I happened upon a review download on Penguin Random House Audio’s Volumes app called Folded Notes From High School by Matt Boren. It ended up being an entertaining, if quick, listen. I think it’s probably a YA novel, which I don’t usually read, but I liked it anyway. This was definitely a light read, but it was entertaining. I enjoyed the different voices of each character, and Tara is someone you love to hate. She gets what’s coming to her in a few different, humorous ways. One issue: the book ends pretty abruptly – at first I thought it was a mistake – and I would have enjoyed a bit more resolution. Folded Notes From High School was excellent on audio. There’s a different narrator for each character, and they were each perfect! Selma Blair in particular was very funny – breathy and dramatic – and the actress who played Tara, Taylor Spreitler, was excellent. This was a very good ensemble cast production and it kept me interested throughout. Posted on May 26, 2018 by gayle. This entry was posted in Audiobooks, Fiction and tagged folded notes from high school, matthew boren. Bookmark the permalink. Sounds good. I’m glad to know you enjoyed it.